The problem: Temperature measurement is one of the most demanding applications of resistance measurement. It requires the measurement of resistance ratios to accuracies of 1 part in 107 or better. While dc resistance standards are sometimes available at this level, ac resistance standards are generally not. So how can we show that our AC or DC resistance bridge is accurate at this level, and that our resistance and temperature measurements are traceable? The linearity check: One simple method for checking a resistance bridge is to measure a pair of resistors separately, and then measure the two in series. Ideally, the series measurement should equal the sum of the two individual measurements. If not, then the measurements give us a little bit of information about the errors in the bridge readings. Note that we do not need to know the values of the resistors to make this test work. The complement check: Another check is to measure the ratio of two resistances, say R1/R2, then swap the resistors and measure the reciprocal ratio (or complement), R2/R1. Ideally, the product of the two measurements should exactly equal 1.0. If they do not, the measurements give us more information on the bridge errors. Once again, we do not need to know the values of the resistors to make this test work. The combinatorial method: The RBC AC and DC resistance bridge calibration system exploits the same principles as the linearity and complement check. 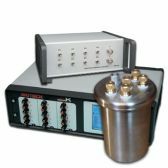 This resistance calibrator uses a network of four stable four-terminal resistors that can be connected in 35 different series and parallel combinations. By measuring each RBC combination in the two different ways (as with the complement check), up to 70 different measurements can be made. Since the RBC has just four unknown resistance values, we have up to 66 independent measurements containing information about the errors in the bridge readings. The combinatorial calibration method is particularly powerful because it is not necessary to know the actual values of the four resistors, or their frequency dependence. This means we can calibrate any ac resistance bridge or dc resistance bridge to any accuracy, so long as the various resistance combinations are accurate. The patented RBC Calibrators are one result of research carried out by Rod White at the Measurement Standards Laboratory of New Zealand, which operates within Industrial Research Ltd (IRL). Isothermal Technology Ltd has an exclusive license from IRL to develop, sell and produce the RBC. Using the RBC: DC and AC resistance bridge calibration is simple. First, take as many of the 70 possible measurements of the RBC combinations as is practical. For a good quality 7-digit bridge, this will take an hour or so. The data is then entered into the RBC software application for analysis. The software carries out a least-squares fit to a model of the bridge error. For most bridges, a simple-low order polynomial is sufficient: but some bridges also exhibit a type of sawtooth error. In some cases, the errors can be recognized as caused by minor faults in the bridge. The software calculates the appropriate corrections to be made for the bridge error, prepares a table and graph of the bridge error versus reading, and the corrections and uncertainties for bridge readings. If required, a calibration certificate can also be printed. User Support: The RBC is supplied with a detailed user manual giving the operating principles of the RBC, instructions for the RBC and software, and a complete uncertainty analysis explaining the limitations in the performance of the RBC and resistance thermometry bridges. We can also provide advice on validation of the software, and alternative applications of the RBC resistance calibrator. The Automatic Resistance Bridge Calibration System is the only solution for the calibration of both AC and DC Thermometry Bridges. (for DC and AC to 400 Hz) <0.01ppm at 100Ω (For DC and AC to 400 Hz. When RBC is temperature controlled). Power supply: None - the RBC is completely passive 5V, via the USB cable. Idle current typically less than 5mA, switching currents less than 200mA. 2U height by half rack width Diamter 88mm, Height 140mm, Identical to Tinsley type standard resistors.